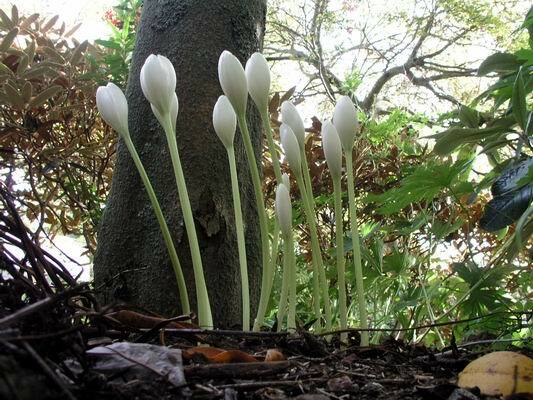 The beautiful Colchicum speciosum album with its large wine goblet shaped flowers is justifiably one of the most sought after of the colchicums. These goblets have yet to open fully and the green stems on this clump are taller than normal because it is growing in deep shade. I am always amazed by the high price that this bulb fetches because it has a good rate of increase - the price is set by what the market will stand and people are obviously willing to pay good money to get hold of it. 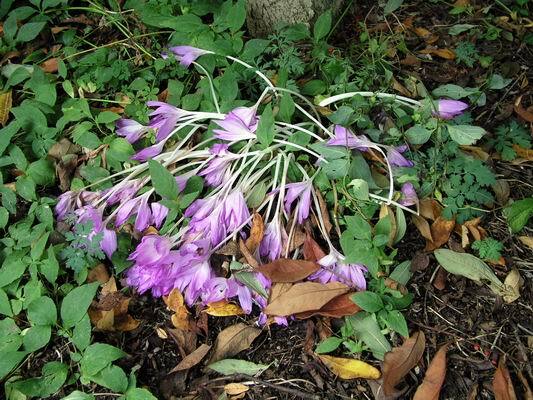 The group of colchicums, that I showed in log 37, has now gone past its best and has been well flattened by the wet windy weather. Despite lying on the ground the flowers will hold their colour for another week continuing to add colour to the garden. 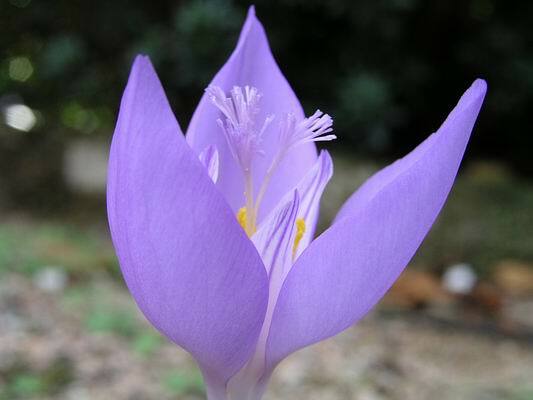 Colchicum laetum has starry shaped pink flowers and is commonly seen around gardens. This is a good garden plant and Bowles states that he received it from the famous Irish Garden, Glasnevin. The RHS Plant Finder suggests it is a form of C. parnassicum. If you are interested in these plants, E.A. 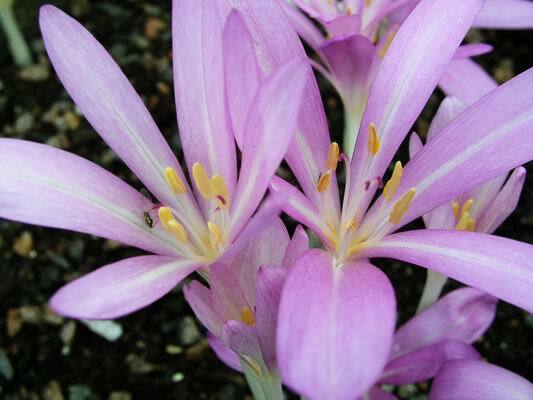 Bowles's book 'Crocus and Colchicum' is a fascinating read as well as a reference book. The nomenclature is understandably not up to date, as it was first published in 1924, but it is full of good information on the plants (species and cultivars) and their history in cultivation. 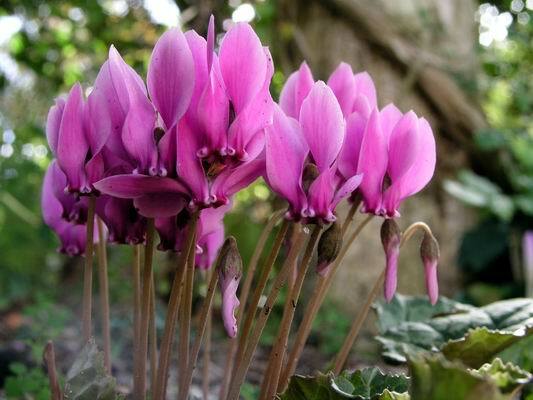 We have a particularly dark form of Cyclamen hederifolium growing in the same bed as C. laetum. This bed has been built up recently, with 10cm layer of old potting and seed compost added, and this cyclamen corm was at the original level and it is having no trouble finding its way to the surface. The other point to note in the picture is that the flowers and stems are spotted with mud splashes as I have not got round to top dressing this bed yet and one of the benefits of a gravel surface is that it prevents this splashing. The very first of our Crocus banaticus has opened. 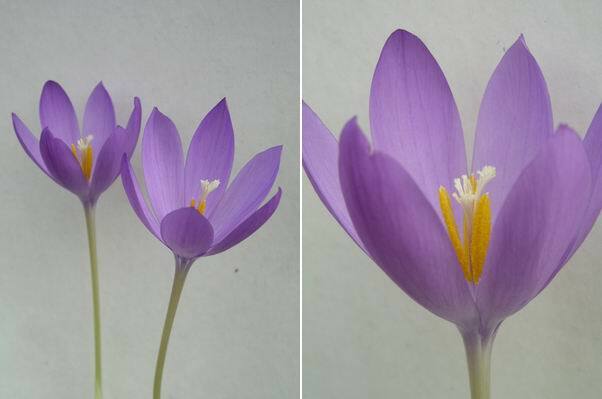 This is a unique species within the crocus as the inner three petals are much smaller than the outer three, giving it a very different look not unlike an iris - at one time this species was called C. iridiflorus. 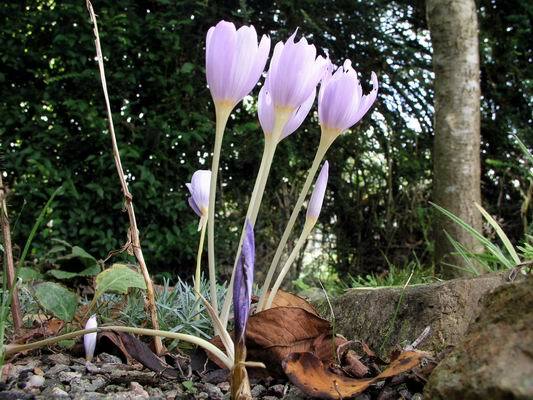 Crocus, like this group of C. kotschyanus, are popping up everywhere in the garden where they have to take their chances with the wind, rain and slugs. 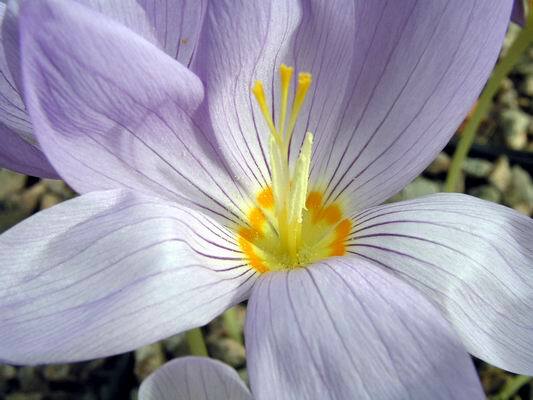 The flower of Crocus kotschyanus is a striking combination of violet blue lines leading down the petals to a zone of rich golden yellow markings in the throat. This species has also been called C. zonatus, acknowledging these beautiful markings. 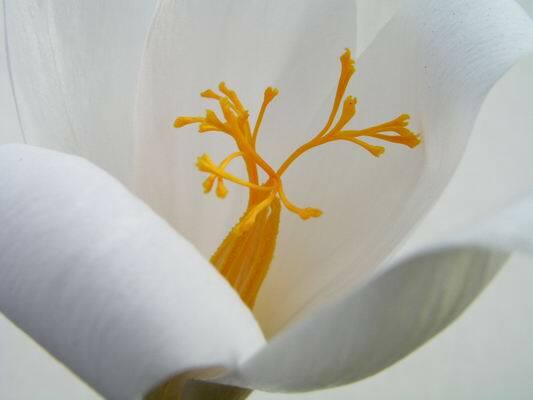 To really enjoy crocus flowers it is best to grow them raised high and under glass so you can get up close to them. That is why we grow so many in the bulb house where we can enjoy their visual beauty and also the fabulous scent in many species. 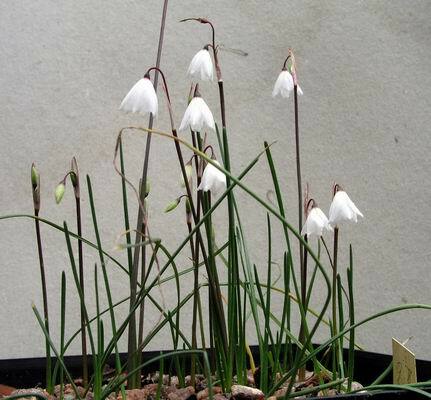 The white crocus in the foreground of the bulb house picture is the one that was much discussed in the forum last year as I was not sure what species it was. Tony Goode was in favour of it being C. pulchellus albus which is on the left in the above picture. On the right is the mystery species and I am almost convinced by Tony but there is still something different about it that sets it as distinct from the other forms of pulchellus albus we grow - it could be a different form. The more you learn about a group of plants the more you realise that placing them into species, sub-species, etc is not that straightforward. Some are easy to place into a species but as you get towards the boundaries of the features that separates one from another you suddenly realise that you enter a grey area where assigning between species becomes almost impossible. Always remember that taxonomic order is a human thing and plants do not always follow these man made rules. While on this subject I will throw another mystery crocus into this arena. 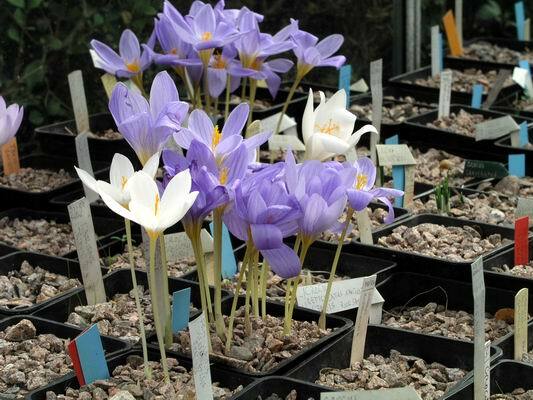 I raised it from SRGC seed as Crocus speciosus which it certainly is not. All the features suggest it is C. nudiflorus except that it has a white style, is this a known variant? All comments and suggestions to the forum please. This is Crocus speciosus albus and I can just spend hours looking at and photographing their beauty which encourages lots of close up pictures. One of the many advantages of digital photography is that each frame does not come with the same high price tag that slide film has and so I can take hundreds in a day and see the results immediately. I used to have net covers hanging over the bulb house doors but they disintegrated a few years back and since then I have had to share my bulb houses with a large clan of house sparrows. I do not mind them making free and easy, basking in the sun, making dust baths in the gravel top dressing but I do get upset when they pull out the labels and I have to wait for a flower to know which pot they go back into. 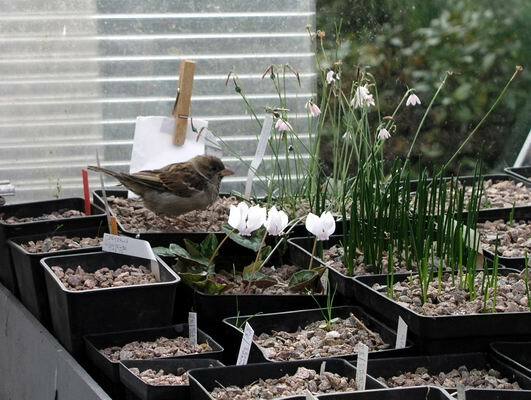 The paper packet behind the sparrow is for the seed from Leucojum roseum some of which has ripened already. We grow Leucojum autumnale in a pot as well as in the garden just so we can enjoy these delicate flowers which can also have a great scent.